Roseann Barr is under serious scrutiny after she sent a racially charged tweets to Valerie Jarret. Jarret was President Barack Obama's former aide. Barr equated Jarret to an ape in a tweet which subsequently went viral. Shortly after comedian/actress/ and writer for the Roseann Show Wanda Sykes quit her position as a writer. Immediately following this news ABC president released a statement of the show being cancelled. The tweet caught the attention of comedian/actress/ and consulting producer of the Roseann Show Wanda Sykes as well as Abc’s president Channing Dungen. Sykes sent out a tweet “I will not be returning to the Roseanne Show” shortly after news spread of Barr’s racist tweet. Immediately following this news, Abc entertainment group president released a statement of the Roseanne show being cancelled. “Roseanne’s Twitter statement is abhorrent, repugnant and inconsistent with our values, and we have decided to cancel her show,” ABC Entertainment President Channing Dungey said in a one-sentence statement Tuesday. Roseanne quickly took to twitter once again in an attempt to clean up her harsh comments by apologizing personally to Valerie Jarret and to the country as a whole. Saying in a tweet ” I apologize to Valerie Jarrett and to all Americans. I am truly sorry for making a bad joke about her politics and her looks. I should have known better. Forgive me-my joke was in bad taste.” Read her full tweet below. The irony in Roseann’s poor tweeting decision is the fact that Abc’s entertainment president is the first African american woman / and first African american person to hold that position. So tweeting racist tweets to a black woman wasn’t a well thought out decision for Barr. I can definitively say that Abc moved fast in response to this racist behavior. 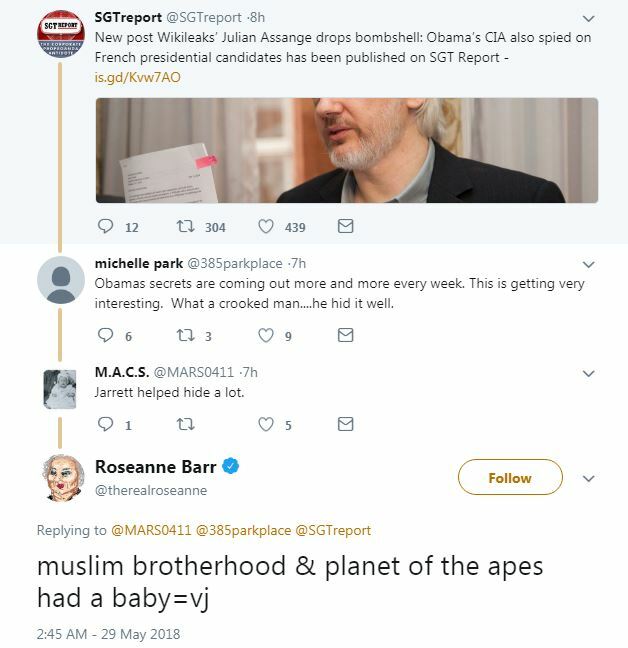 In less than 24 hours of the initial tweet, Rosanne Barr’s show has been cancelled.